Travels in Turkey - “From a Goddess to a Belief System"
Travels in Turkey- “From a Goddess to a Belief System"
"You Only Truly Believe That Which Drives You To Action"
In ancient times the peoples of the world were pagans, they believed in many, many Gods. Some of these Gods originated in Greek myths, Zeus, Apollo, Athena, Aphrodite etc. Some of the Gods changed their names when the Romans came along. For example, Zeus became Jupiter, Athena became Minerva, and Aphrodite became Venus. One God, Apollo, got to keep his name. The people of the time believed that everything that happened to them was the result of one or more gods being upset. They weren't being paid enough attention to. So the person would sacrifice an animal or donate something to the offended God to appease him or her and then hopefully things would go back to normal or at least the bad things that were happening would stop. A belief that has carried through from all those years ago is the evil eye. The evil eye originated from the myth of the gorgon, Medusa. Medusa was a beautiful woman with blue eyes and supposedly, hair of snakes. She had the power to turn anyone who looked at her into stone. In the Greek myths she was slain by Perseus, who cut off her head and carried it with him to use against his enemies. That tradition carried forward in the form of a small Medusa amulet that people would carry with them to ward off the evil eye. The evil eye is called this because it refers to anyone who looks at you in an envious or jealous way. The people believed that envy and jealousy was evil and could create bad luck for you. During the Christian times the authorities wanted to eliminate any connection to the old pagan ways so they made it illegal to carry the amulet of Medusa. So eventually the amulet evolved into a blue eye. If questioned the people would say it was the eye of a fish, the symbol of Christ. But it wasn't. Today you can see the evil eye everywhere in Greece and Turkey. This ancient story is a reminder of the power of belief. Over thousands of years people have continued to believe in the power of the evil eye. Today many such beliefs have carried over, such as throwing spilled salt over your left shoulder (to ward off bad luck) covering your mouth when you yawn (so spirits can't go into your body), etc. So if we can believe in things that we know aren't real and don't really have any current relevancy how strong could our own internal, silent beliefs be? 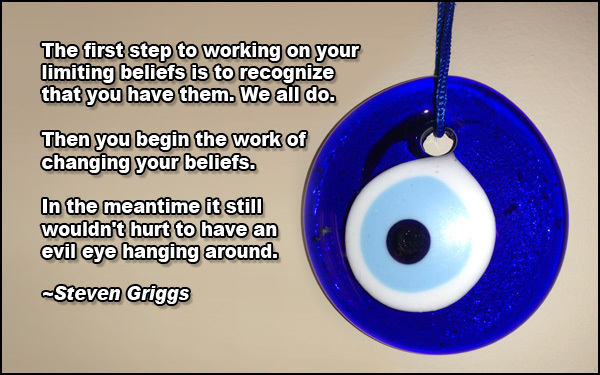 As a way to get a glimpse into your beliefs, watch yourself. Watch how you talk to yourself. Do you hear the comments you make to yourself? "I don't really like to socialize, I think I'll just stay home" "I could never do what he does, he has guts" "What do I have to offer?" These are clues into your underlying beliefs. What do you really believe to have this thought? Watch yourself, watch how you operate. The first step to working on your limiting beliefs is to recognize that you have them. We all do. Then you begin the work of changing your beliefs. In the meantime it still wouldn't hurt to have an evil eye hanging around.